CANNES, France—The U.S. doubled its 2013 Grand Prix count in a single award ceremony here tonight, as Draftfcb and Pereira & O'Dell were both honored as Grand Prix winners in the Cyber Lions. Draftfcb in New York won for Oreo's "Daily Twist" campaign, while Pereira & O'Dell in San Francisco was honored for its Intel/Toshiba project "The Beauty Inside." Oreo rejuvenated itself in spectacular fashion with the "Daily Twist" campaign. 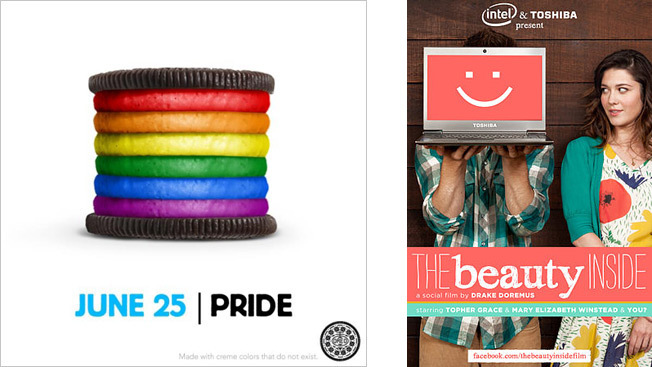 Conceptually strong and executionally brilliant, the campaign produced 100 pieces of content in 100 days in which Oreo cookies illustrated current-events stories or historical anniversaries—beginning last June with the gay pride rainbow cookie heard around the world. The brand's adorable images became a vital part of pop culture, the digital world and the everyday conversation. "The Beauty Inside" was a fascinating episodic social film on Facebook in which the main character woke up as a different person every morning—and one day, against his better judgment, falls in love. It starred Topher Grace, Mary Elizabeth Winstead and dozens of ordinary fans who auditioned via webcam to help portray the main character, Alex. It felt fresh for a branded-content space dominated by thrillers and juvenile comedy, and was a great fit for Facebook, which, at its best, is its own giant compendium of love. Scroll down to see the whole series. The U.S.—which also won Grand Prix in Innovation and in Press this week—did well throughout the Cyber category, adding four Gold Lions, eight Silver Lions and eight Bronze Lions. In addition to its Grand Prix, "The Beauty Inside" also picked up a gold and two silvers. The Martin Agency's "Clouds Over Cuba" campaign for the JFK Presidential Library and Museum also won four Lions in total—two golds, a silver and a bronze. The final U.S. gold went to Hudson Rouge in New York for Lincoln Motor Company. That work also won a bronze. R/GA in New York won a silver and a bronze for seasonings company McCormick's "FlavorPrint" effort. The other U.S. silver winners were Droga5 in New York for Prudential; BBH in New York for Axe; De-De in New York for its ThunderClap app; and Wieden + Kennedy in Portland, Ore., for Old Spice's "Muscle Music." The other bronzes went to Venables Bell & Partners in San Francisco for eBay Motors' custom car web series Built; BBDO in New York for Lowe's Vine videos; Droga5 for the UNICEF Tap Project; 360i for the Oreo blackout tweet; and Ogilvy & Mather in New York for IBM's "The World's Smallest Movie."